A young man about to begin a journey pauses to view the trail ahead of him. He sees the path winding among distant hills and a pale sky, streaked in colors of blue, green and lavender. Note the mottled texture of vegetation on the borders of the path. What does the young man hold in his left hand? and at the right hand there is pleasure for evermore"
The window was given in memory of Frederica Clarkson (1846-1909), one of four daughters of Elizabeth (1810-1883) and Thomas Streatfeild Clarkson (1799-1873). In 1840, six year-old Frederica, her parents, brothers and sisters left New York City and arrived in Potsdam to live in “The Homestead,” one of three Clarkson residences built on the hill now occupied by the university campus. A mature Frederica is shown sitting on the porch of Woodstock Lodge, now the alumni center on the campus of Clarkson University. 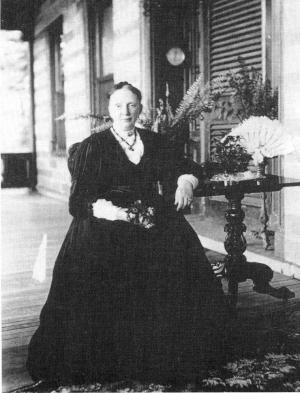 Undated photograph of Frederica Clarkson (1846-1909) at Woodstock Lodge on Clarkson Hill. From The Clarkson Family of Potsdam, a 2002 publication of the Potsdam Museum. This window is entitled "The Path of Life," from Psalm 16:11. It makes full use of Tiffany’s so-called “opalescent” style -- in which the different colors within the glass blend into one another. As a result it is most the atmospheric of all our windows. It has this way of drawing you into the landscape, with the sun just about to rise over the Mountains. It reminds me of C.S. Lewis’ phrase about heaven drawing us “further up and further in” to God’s perfect reality. If you look carefully, you will notice that there is a fork in the path and seems to diverge to the right, whereas the other route takes us to the rising sun just behind the hills. It is all too possible to get off track in our lives, to choose paths that deflect us from our purpose. Psalm 16 reminds us that if we place our trust in the risen Christ, he will lead us where we need to go.